Are you looking for a premium quality, maximum juice, and nutrition extracting juicer? A twin gear masticating juicer uses two gears rotating together to grind fruits and vegetables or other products to extract the maximum amount of juice, nutrients, enzymes, and minerals. Read the review below to see if the upgraded Super Angel PREMIUM DELUXE Juicer performs its task and lives up to the excellence of the Super Angel brand. The Super Angel PREMIUM DELUXE juicer is a top of the line, twin auger masticating juicer. This highly rated juicer is built to last. The slow speed twin auger design extracts up to 95% of the juice leaving the driest pulp possible. It also runs cool avoiding oxidation ensuring maximum extraction of vitamins, enzymes, and nutrients in the juice. The juice stays fresher and lasts longer without losing its health benefits. From the 2014-2015 models on major upgrades were made to the motor, safety sensor, and main control board. The twin augers and standard housing are made of surgical grade 316 stainless steel, the other parts are made of food grade 304 stainless steel. Warranty is 10 years on the motor and gears and 5 years on wear and tear. It is definitely one of the best juicers available and one of the healthiest ways to make juice compared to other types of juicers. Soft Fruit Extracting Housing not included with PREMIUM DELUXE model, it must be bought separately. The DELUXE model includes the soft fruit extracting housing. Small (1.7″) food chute diameter means more prep time to cut fruit and veggies into smaller chunks. Super Angel PREMIUM DELUXE Twin Gear Masticating Juicer – What Is It Used For? The Super Angel PREMIUM DELUXE juicer can be used for almost anything from carrots and apples to wheatgrass and spinach. 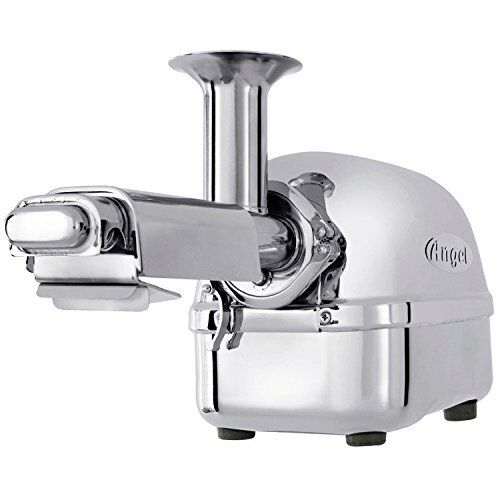 Use it as well to make soymilk, tofu, nut butter and frozen fruit sorbets. Keep in mind that juicing removes valuable dietary fiber. That’s what is in the pulp. Fiber is an important part of a balanced diet so be sure to eat raw fruit and vegetables for the fiber content. Or, use the pulp creatively by adding it to your recipes. Why let a good thing go to waste? Super Angel PREMIUM DELUXE Twin Gear Masticating Juicer – Who Is It For Or Not? This is a serious juicing machine for the serious juicer and will be the only one that you will need for years to come. If this is not what you are looking for, there are many other juicers available. Read my Small Kitchen Appliances For You – Juicers page to find one of the many others that might better suit your needs. Amazon customer review average rating is 4.9 out of 5 stars (100% positive 4 or 5 out of 5 stars). However, Fakespot analysis indicates that only 66.7% of the reviews are reliable and gives the reviews a Grade C.
For serious juicers that understand the value of highest quality healthy juices and a well-built long-lasting juicing machine, I give the Super Angel PREMIUM DELUXE Juicer a score of 95 out of 100 and a super highly recommended Buy. Click on the image below to learn more and to Buy on Amazon. Learn more about juicing, read my how is juicing healthy post. Do you have a Super Angel PREMIUM DELUXE Juicer? Share your opinion, comments or questions on this or any other juicer based on your personal experience in the comments box below. And don’t forget to like and share this review with your friends via social media. Click on your favorite icon. If you enjoyed this article, why not subscribe to get the latest updates and news about small kitchen appliances for you. Your email will not be shared with anyone else and your inbox will not get stuffed with spam.